Transparency Market Research has published a new report titled, “Transfection Technology Market - Global Industry Analysis, Size, Share, Growth, Trends and Forecast, 2013 - 2019”, according to which, the global transfection technology market is expected to grow from US$386.4 million in 2012 to US$768.2 million before the end of 2019, registering growth at a 9.7% CAGR. According to the report, the global market for transfection technology will be driven by growing incidences of various cancers such as lung cancer, prostate cancer, and breast cancer. Apart from this, rising prevalence of obesity, increasing number of cardiovascular diseases such as arrhythmias and ischemia among the global population, and the bolstered production of mass protein are some of the key factors augmenting the global market for transfection technology. The rising need to combat infectious diseases such as H1N1 and H1N5 has also contributed to the mounting demand for tranfection technology in the global market. The report has been compiled with the intent of providing in-depth assessment of factors affecting the demand for transfection technology products in the global market in order to help stakeholders take informed decisions and plan their expansion move accordingly. In order to provide clarity in market information, the report has segmented the global transfection technology market on the basis of technology, applications, and geography. 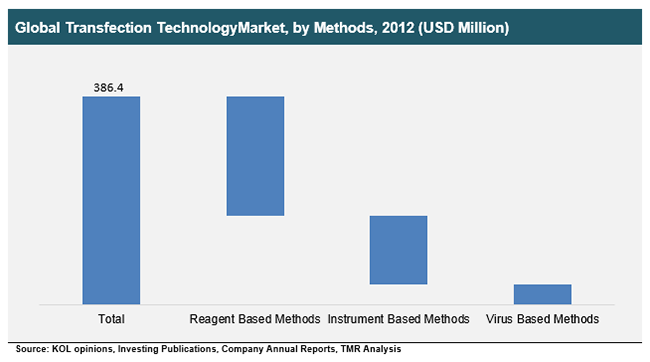 In terms of technology, the global transfection technology market is segmented into reagent-based, virus-based, and instrument-based methods. The reagent-based segment is further classified into activated dendrimers, magnetic beads, DEAE-dextran, cationic polymers, lipid mediated transfection (Lipofection), and calcium phosphate. According to the report, the reagent-based transfection technology segment registered outstanding rise in demand in the last couple of years owing to the cost-effectiveness and simpler functionality of the technology. Furthermore, growing demand registered by emerging biopharmaceutical markets across Asia Pacific will create significant opportunities for the transfection technology market to capitalize on. Geographically, the global market for transfection technology is divided into North America, Europe, Asia Pacific, and Rest of the World (RoW). Among the different regional segments, North America emerged as the largest market for transfection technology in 2012, accounting for approximately 45% of the global market share in terms of revenue. Factors such as rising awareness about the benefits of transfection technology and increasing government initiatives taken to promote the technology is expected to propel the growth of the market in the forthcoming years. Despite registering a steady growth rate in the recent past, the global market for transfection technology is not free from restraints. The analyst of the report states, “Technological complications and cytotoxic effects often associated with virus-based and instrument-based methods implemented in transfection technology might hamper the growth of the market to a certain level.”The global market for transfection technology is highly fragmented in nature. In terms of key players, the market is dominated by companies such as Mirus Bio LLC, Promega Corporation, Lonza Group Ltd, Life Technologies Corporation, and Polypus Transfection S.A.